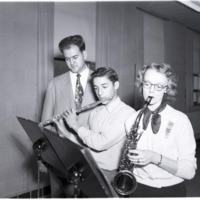 This image shows three attendees of a 1953 All-State music clinic practicing on different musical instruments. The original envelope was labeled "All-State Band Clinic 2-7-53" and had been filed under "Music Clinics." 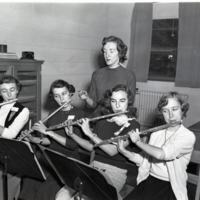 This image is of several young women practicing on flutes while at a band clinic. The original envelope was labeled "Band Clinic, A.S.T. [unintelligible], 1-30-54" and had been filed under "Fires."